Welcome to the Armel-Leftwich Visitor Center of the United States Naval Academy. Visit the United States Naval Academy in Annapolis, MD to see where future officers are educated and trained. The “yard,” as the lush grounds of the Academy are called, reflects the beauty of Beaux Arts architecture and historical monuments commemorating naval events. The Visitor Center is conveniently located inside USNA Gate 1 at the Annapolis harbor. Pedestrian entrances are on Prince George and Randall Streets. The Visitor Center provides guided walking and riding tours for the public and a variety of guided walking tours for pre-formed groups. Anyone 18 years of age or older must present a valid, unexpired original REAL ID Act compliant government photo ID card (e.g. state issued driver’s license or identification card); or an original, unexpired passport to enter USNA grounds. Visitors from states and territories that are not REAL ID Act compliant must present additional acceptable identification such as a SSN card, unexpired passport (book or card), birth certificate, voter registration card. Visitors who are NOT US citizens MUST present an original unexpired passport for entry. As a precaution, it is encouraged that visitors and guests carry an additional form of identification and that the best bet is always an original UNEXPIRED PASSPORT. shopping experience. The Gift Shop can be found online at navyonline.com. 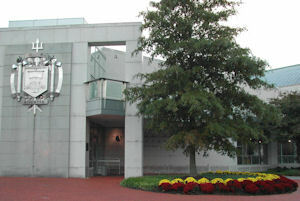 All proceeds from the sale of tours and merchandise benefit Brigade of Midshipmen activities.The Visitor Center is the first stop on a visit to the undergraduate college of the U.S. Navy and U.S. Marine Corps. Information specialists welcome visitors to view the 13-minute film, The Call to Serve, and to take a guided walking tour with a professional, certified guide. United States Naval Academy Admissions briefings, lasting approximately one hour are held at 10:00 a.m. and 2:00 p.m., Monday through Saturday, on the second deck of the Visitor Center. For information on federal holiday closings visit the Admissions website. The museum’s artifacts are displayed in galleries located on two floors in Preble Hall. 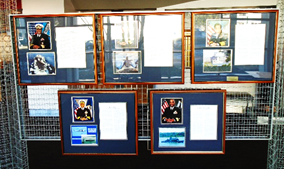 The first floor is devoted to the exhibit entitled ”Leadership and Service: The History of the United States Navy and the Naval Academy.” The famous Rogers Collection of antique ship models is the focus of the second floor exhibit. For information on attractions, restaurants and events in and around Annapolis, please see the Visit Annapolis website. For information on other historic sites in the Annapolis area, visit the Four Rivers Heritage Area website.